Treat skin to the HealGel Sample Box; a pair of the brand’s best-selling treatments that utilise scientific developments to repair and rescue skin while tackling a range of issues including dryness, sensitivity, redness and discolouration. Ideal as an introduction to the skincare line or for travel purposes. Boasting a unique formula, HealGel Intensive is an effective multi-purpose gel packed full of active ingredients that work in tandem to restore, protect and soothe the skin. Perfect for frequent use, the advanced formula is scientifically-designed with complexes such as arnica and madecassoside, which reduce the appearance of puffiness and discolouration whilst soothing irritations and reducing sensitivity. Non-oily and ultra-cooling. HealGel Eye is an intelligent corrective formula designed to condition and lift the delicate eye area whilst minimising the look of dark circles and puffiness. It contains a dual action hyaluronic acid complex that locks moisture deeper into the skin and firms the eye contour, whilst other collagen-boosting active ingredients such as liposomes with powerful peptides and biodynes soothe the skin. 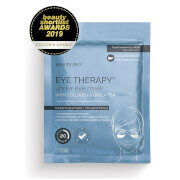 The effect is to soften the appearance of fine lines, even skin tone and improve elasticity through intense hydration. Intensive: Aqua (Water), Dimethicone, Cyclopentasiloxane, Polysilicone-11, Glycerin, Ammonium Acryloyldimethyltaurate/Vp Copolymer, Penoxethanol, Butylene Glycol, Saccharomyces Lysate Extract, Madecassoside, Olea Europea(Olive Oil) Fruit Oil, Methylsilanol, Hydroxyproline Aspartate, Arnica, Montana Flower Extract, Laminaria Digitata Extract Phospholipids, Alcohol, Simmondsia Chinensis(Jojoba)Oil, Glutamylamidoethyl Indole, Oryza Sativa Extract, Hexapeptide-9, Hexapeptide-3, Parfum(Fragrance), Linalool, Limonene, Steareth-20, N-Hydroxysuccinimide, Chrysin, Palmitoyl Oligopeptide, Palmitoyl Tetrapeptide, Disodium Edta, Ethylhxylglycerin, Chlorhexidine Digluconate, Salicylic Acid, Sodium Benzoate, Potassium Sorbate.